In the 15th century, a fabulous journey awaited those who could unlock the secrets of the Earth's geography. Beautifully written and emotionally compelling, 1492: Admiral of the Ocean-Sea tells of the famous adventures of Columbus and his men, who sailed into the almost mythical seas beyond the horizon in search of the "New World", in the hopes of attaining vast wealth and power. This brilliant book, by best-selling author Mary Johnston, traces the long route taken by explorers hoping to locate Asia. Based on their limited means and understanding of navigation, they struggle to find their position, while at the same time encountering many natural wonders and exotic peoples. Tensions build as they appear to become increasingly lost. Columbus and his crew begin to lose hope, until they finally receive the vindication of their bold vision. 1492: Admiral of the Ocean-Sea pays special attention to the conditions of the late 15th century period. It describes the competition between classes and ethnic groups in Spain, as well as the clashes that occurred when people from two very different cultures, native American and European, interact. These issues are not merely abstract, since we see them vividly through the eyes of a disenfranchised individual: a Christian sailor of Jewish background, who has been compelled to lead a secretive and solitary existence. The incidents of his life are brought to us in a handsome, elegant language, uncommon in the books of our day. 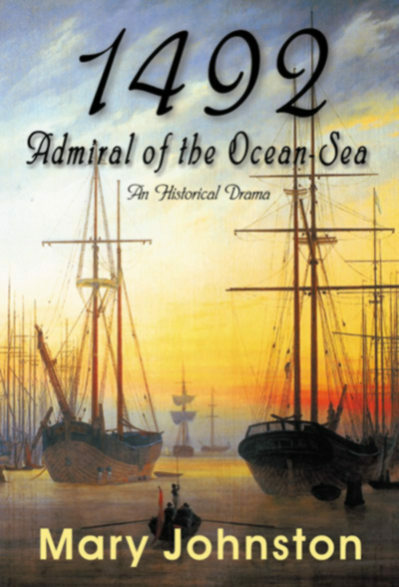 1492: Admiral of the Ocean-Sea is a marvelous work that brings together history, drama, idealism and art. To purchase the book from B&N, please click here.